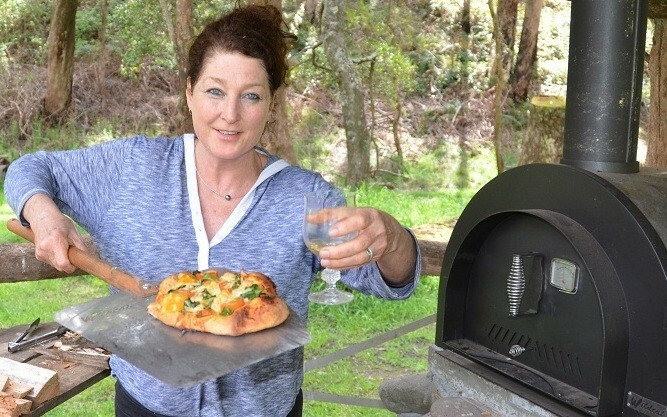 Sally was so excited to show us her first ever Wood Fired Pizza! Hi, Could you please supply the recipe for the pizza dough? 1.Mix the salt with the flour. 3.Add the yeast, crumbling it with your fingers. 4.Do not overheat the water or the yeast will die. 5.Put the flour and salt into a bowl and make a well in the centre. When the yeast is foaming, after approx 10 minutes, add the water and honey and olive oil to the flour. 6.When it forms a mass, turn it out onto the bench and knead. 7.Continue kneading for 8 minutes, until the dough is strong and elastic. 8.Place the dough back in the bowl and allow it to prove in a warm place until the dough doubles in size, about 1 hour. I use this recipe with bread flour, as you can see it is a bit more simple. Add most of the water & the oil mix thoroughly. Use the remaining water if the dough is too dry, but try not to make it too sticky. Turn out onto a floured work area & knead for 30 seconds. Place in a draught free spot for 1 – 1 ½ hours, until it doubles in size. *While the dough is rising prepare your toppings & light your Wildcat Oven. Heat the oven to 220oC -250oC. Tip the dough out onto a floured work area & roll into a ball. The dough is now ready to use. This is enough dough to make two 30cm pizza bases. You can use whole meal flour if you prefer. *To give the dough more flavour add ½ a cup of Grated Parmesan &/or 2 Tsp Garlic, Chili or Dried Herbs.